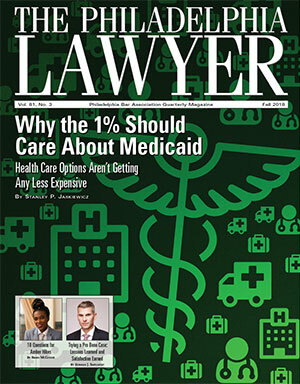 The Philadelphia Lawyer is the Association's quarterly magazine. It provides information on the practice areas of the law, lifestyles, technology, fiction, book reviews and other topics of interest to Philadelphia lawyers. The Philadelphia Lawyer is particularly interested in receiving substantive legal articles that allow you to share your expertise with your colleagues. You are invited to submit articles for consideration by the Editorial Board. Original materials, previously unpublished, are required. 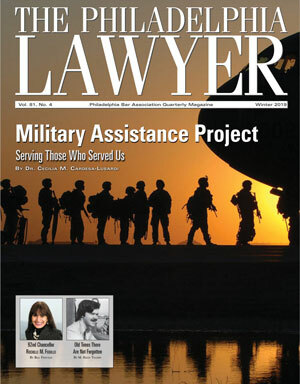 Letters to the Editor are welcome on any topic relating to the law, the profession, the Philadelphia Bar Association or The Philadelphia Lawyer magazine. Editors reserve the right to condense for clarity and space considerations. Letters must be signed, but names will be withheld upon request. The Philadelphia Lawyer is copyrighted and may not be reproduced without the express written permission of the Philadelphia Bar Association.